John Collins leaving the Goukamma River at Blackwaters River Lodge and Mashie Course at the Expedition Africa's 1st transition area today (Sunday, May 15). KNYSNA NEWS & VIDEOS - Knysna's own Team Painted Wolf, sponsored by Featherbed Co, was leading the Expedition Africa 2016 field of 54 international teams after the first transition at Blackwaters Lodge today (Sunday, May 15) around 13:30. 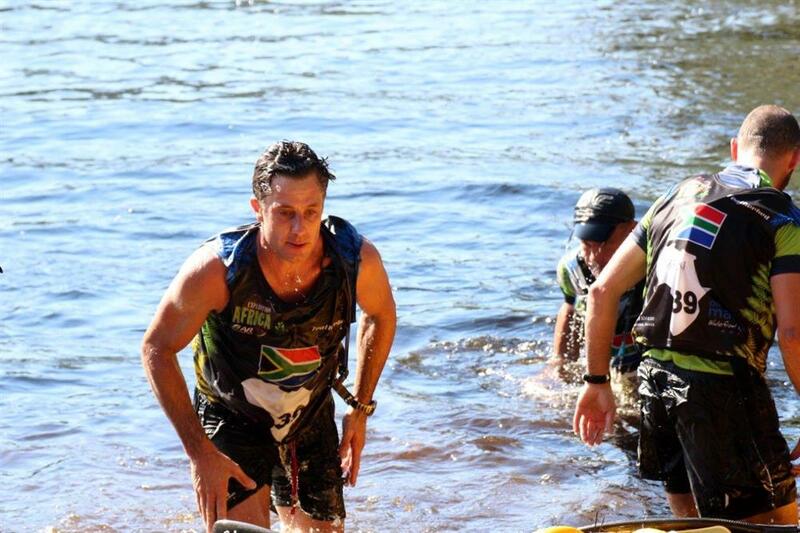 The teams left on their gruelling race route at 08:00 across the Knysna estuary and after traversing Brenton-on-Sea, Buffe'ls Bay, Walker Bay, Goukamma River, Karatara, Beervlei and Hoogekraal they will finally lay their heads down in Gouna tonight. At 18:38 Team Painted Wolf was still in the lead with French and Belgium Team Naturex following. In third lies the Swedish Team Sweco Adventure. The public can follow the teams' progress online via live tracking at www.expafrica.live. Select the 'live coverage' button and it will allow for the selection of live tracking, leader board, news, photographs and videos. Kinetic Events Africa Facebook page will offer further updates, as will Twitter - @kineticeventsza and Instagram - @expafrica. Expedition Africa 2016 is estimated to last approximately 72 hours for the winning team (sleep excluded) and 6 days for the last team in. The route consists of 16 legs with 13 transitions. Three cut-offs on route will be enforced for slower teams to be re-routed. The mountain biking section of the race covers 53% of the route, a total of 273km over 5 different legs. The trekking, 31%, 161km with 4 legs and kayaking 86km, which is 17% of the route with 7 legs. All teams are expected to be finished on or before Saturday May 21 in time for the official prize giving later the evening. Watch a video interview with Knysna & Partners CEO, Greg Vogt below. Darren Berry, Jeannie Bamford, and John and Mark Collins heading towards today's first Expedition Africa Transition point. Team Painted Wolf leaves on their second leg of the Expedition Africa 2016 adventure race. Expedition Africa 2016's Team Painted Wolf preparing to leave on the second leg of the course.